The fourth-largest city in Indiana, South Bend is a unique Midwestern city that offers visitors a range of things to see and do, including museums, outdoor attractions, sports games and performing arts. 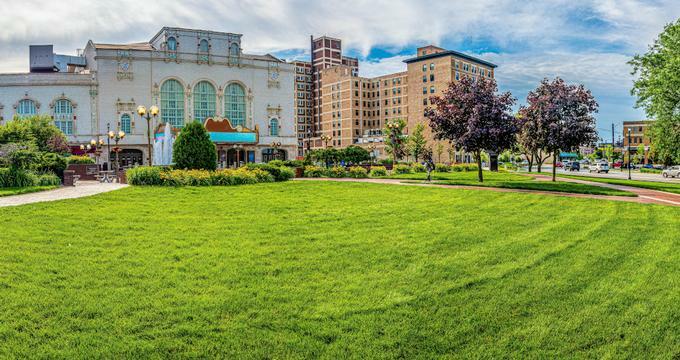 Best things to do in South Bend, Indiana, with kids include the South Bend Chocolate Factory and Museum Tours, HealthWorks Kids' Museum and the Potawatomi Zoo. 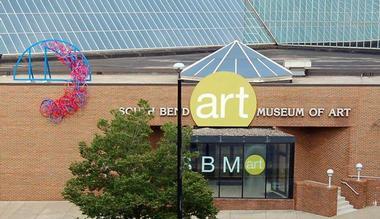 Founded in 1947, the South Bend Museum of Art is a fine arts museum located on South St. Joseph Street in downtown South Bend. Housed in the Century Center designed by Philip Johnson and John Burgee, the museum features pieces of local and regional artwork. The contemporary and historical art is exhibited in five galleries. The permanent collection is displayed in the Carmichael Gallery while the Warner Gallery showcases national traveling exhibits. The Jerome J. Crowley Community Gallery features works by local artists, and the Art League Gallery exhibits works by artists from the Midwest. River Lights is a light display on the St. Joseph River near Century Center Island and Seitz Park in the heart of downtown South Bend. Several interactive light sculptures create colorful light displays that are thematically based and add to the festive atmosphere of holidays and special events. From sunset until midnight, motion sensors prompt the light display; when people walk by the interactive sensors, the colors and patterns of the lights change. After midnight, the interactive feature stops and the lights remain a natural color. Designed by Rob Shakespeare, River Lights celebrates its 150th anniversary of its induction into the city of South Bend. The Potawatomi Zoo is a 23-acre zoo located on South Greenlawn Avenue in South Bend. It is the oldest zoo in Indiana, and it originally opened as a duck pond called the “outh Bend Zoo in 1902. The farm-style barn that was added in 1949 still stands today, and it serves as part of the petting zoo. Although owned by the city, the zoo is maintained and operated by the Potawatomi Zoological Society. If you are wondering what to do in South Bend with kids, this is a great place to visit. The zoo contains more than 400 animals and features animals from Australia as well as several primates and large cats. In addition to the petting zoo, children can learn about the animals through classes and programs like ZooCamps. Located on West Sample Street, the South Bend Chocolate Factory and Museum Tours offers tours of its facilities from Monday to Saturday. 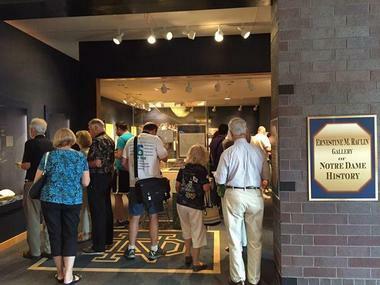 The company offers two tours: the 45-minute tour Inside Scoop Tour and the 20-minute Basic Tour. Private guided tours for groups of ten or more people are available. The South Bend Chocolate Company was founded in 1991, and the facility is 60,000 square feet in size. In addition to producing a large variety of chocolates, the company also sells other products such as coffee, fruits, nuts, and gift bags. Located on West Jefferson Boulevard, the HealthWorks! Kids’ Museum is a health and fitness-based children’s museum that features exhibits, a mini climbing wall, an indoor playground, and much more. The museum offers a large variety of educational programs including camps and school field trips to the museum. HealthWorks! Kids' Museum is one of the top things to do in South Bend, Indiana for families. Super Scrubbers is a program designed to teach young children about germs, and Food Group Frenzy teaches them about different types of food and why their bodies need them. Kohl’s Fit Festival is an outreach program that teaches fitness and nutrition at schools, company picnics, and other group events. Located on the campus of the University of Notre Dame, the Snite Museum of Art is an art museum that contains more than 23,000 works of art. Although the collection represents art from all over the world and from many periods, its primary focus is on Western art. Its examples of Italian Renaissance paintings and its Mesoamerican art objects are especially popular features. Opened in 1980, the museum contains works by notable artists such as Boucher, Corot, Courbet, and O’Keeffe. The museum offers an extensive education outreach programs for children, including after-school programs, summer camps, and camps for at-risk children. Located on Chapin Street, the Studebaker National Museum features a collection of Studebaker cars, carriages, wagons, and military vehicles as well as other objects related to U.S. history. The three-story museum is connected to and shares an entrance with the History Museum. The main floor displays Studebaker cars from the 1800s up until 1934, and it showcases the history of the Studebaker and the Oliver families. Cars from after that year are exhibited on the upper floor, while the lower level is devoted to military equipment and vehicles. Group tours are available. More Indiana destinations: 25 Best Things to Do in Indianapolis. The Notre Dame Stadium is an outdoor football stadium located on Moose Krause Circle in Notre Dame just north of South Bend. Modeled after Michigan Stadium, Notre Dame Stadium is the home playing field of the University of Notre Dame Fighting Irish. When the stadium opened in 1930, the playing surface was natural grass and the stadium had 60,000 seats. After renovations carried out in 1997 and 2014, there are now more than 80,000 seats, and the playing surface is made of FieldTurf, an artificial surface. Guided public tours as well as private tours are available, and they allow visitors to learn about the history of the stadium and visit the locker room and the field. The Morris Performing Arts Center is a concert hall located on North Michigan Street in South Bend. Built in 1921 as a vaudeville house, the building later became a movie house. It was slated for demolition in 1959, but it was saved and remodeled and restored between 1998 and 2000. Originally called the Palace Theater and then the Morris Civic Auditorium, the center contains 2,564 seats and retains its original European architectural style and color scheme of blue, cream, and rose. In addition to hosting concerts, Broadway shows, and other special events, the center is the home of the South Bend Symphony Orchestra. The center is listed on the U.S. National Register of Historic Places. More Indiana places to visit: 16 Best Romantic Weekend Getaways in Indiana. Located on South Michigan Street, the South Bend Brew Werks is the only brewpub in the downtown area of South Bend. The pub features five house brews: Amber, Black IPA, Oatmeal Stout, Smoked Porter, and Wheat. They also offer five rotating brews. The decor of the pub consists of of reclaimed items such as chairs, stools, and tabletops, all of which were found locally. The pub’s delicious food also uses locally sourced produce and ingredients. Local artists created the eye-catching artwork displayed on the walls of the pub. The displays change monthly and the art is for sale. The Indiana Whiskey Company is a veteran owned and operated whiskey distillery located on West Sample Street in South Bend. Founded by war veteran Charles Florance in 2011, the company uses Indiana grains such as barley, corn, and wheat as well as equipment made in Indiana. Some of the company’s whiskeys include Just Whiskey, Silver Sweet Corn Whiskey, and Straight Cardinal Red Whiskey. In addition to whiskey, the company sells bottles and glassware, and they offer tours of the distillery Monday through Friday. Their tasting room is open on Wednesday, Friday, and Saturday. Indiana Whiskey is sold in 120 retail stores around the state of Indiana. Located on Northside Boulevard, the South Bend Farmer’s Market has a long history, as it was first established in 1924. The Colfax Street Bridge served as the market’s first site from 1911 to 1923, when it outgrew its location. Eventually, it moved to its current location. In 1971, a fire destroyed part of the market, and a new building opened in 1972. The vendors at the market offer fresh local and homegrown dairy products, eggs, flowers, fruit, meat, poultry, and vegetables. Other items for sale include art, handicrafts, jewelry, and more. The market is open on Tuesday, Thursday, and Saturday. It is also open on Friday from May through September. 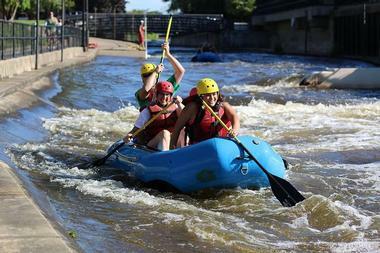 The East Race Waterway is a white water rafting course whose facilities are located on North Niles Avenue in downtown South Bend. The 1,900-feet waterway took two years to build and opened in 1984. It is appropriate for both beginners and advanced users. Equipment for rafting is supplied, but kayakers must supply their own kayaks. A ride on the waterway course takes about five minutes. In addition to the waterway course, there are over three miles of walkways, an amphitheater, picnic tables, and restrooms. Along the paths, visitors can watch the competitions to which the waterway plays host. The waterway is open on Saturday and Sunday from June to August. The History Museum exhibits objects related to the local history of the South Bend region. Exhibits display documents, drawings, photographs, records, and much more. Originally called the Northern Indiana Historical Society in 1867, the museum changed its name and moved to its new facility in the West Washington Street historic district in 1994. Exhibits include Pieces of South Bend, The Masks of Lincoln, On the Move: Transportation through the Ages, and more. The museum is open every day, and guided tours of the Oliver Mansion and the Worker’s Home are offered from Monday through Saturday. The Kidsfirst Children’s Museum is open Monday, Wednesday, Friday, and Saturday. Located on the campus of the University of Notre Dame south of the Joyce Center, the Compton Family Ice Arena is a 5,022-seat ice arena. Opened in 2011, the ice arena features two rinks, one of which is Olympic sized, and is used by the University of Notre Dame’s Irish men’s hockey team. The 200 feet by 90 feet ice rink is named after the hockey program’s first coach, Charles W. “Lefty” Smith, Jr. The facility also includes locker rooms, several offices, and a weight room. In addition to the hockey team, other members of the campus and the community are permitted to use the ice arena. More places to visit: 25 Best Things to Do in Indianapolis.